Do you have a minute to spare to learn some English? 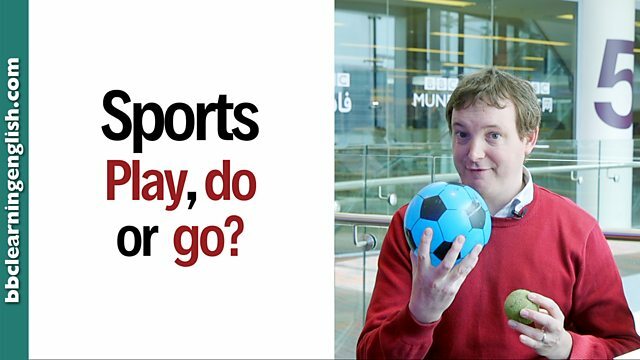 Watch Phil finalise the use of 'play', 'do' and 'go' for sports! Give us 60 seconds and we'll give you the English! Hi, I'm Phil from BBC Learning English. Today, I'm going to tell you how we use play, do and go with different sports. So, for team sports or ball games, we use play. So, I can say: I play football. I don't play tennis. For more individual activities, we use do. So, we can say: I do exercise. I don't do judo. Then, for activities ending in –ING, we often use go. So, I can say: I go running. Or: I don't go swimming. Of course, there are some exceptions, but try to remember. Play for team sports or ball games. Do for individual activities and go for activities ending in –ING. We use play for team sports or ball games. Will we play hockey tomorrow? We use do for more individual activities. Have you ever done aerobics? Is this a team game or a game with a ball? Is this an individual activity? Is this an activity ending in -ING? Which verb do we use? Complete this sentence: I love team games. Personally, I love to ______ volleyball. Complete this sentence: I'm very nervous. I've never ______ hiking on my own. Complete this sentence: At 6 in the evening yesterday, I was ______ yoga.